sunshine blog » Which one: Disney California or Disney Florida? So, you’ve set your sites on America, and you want to enjoy one of the country’s classic tourist experiences: Walt Disney….er, wait. 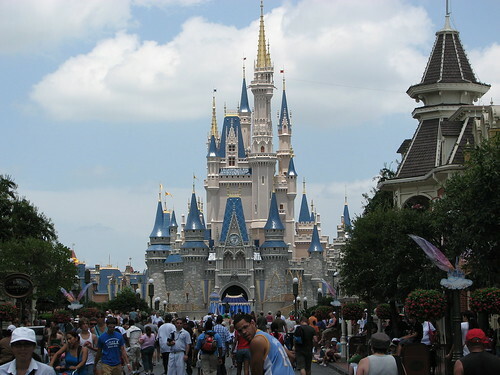 America has not one, but two Disney attractions: Disneyland Resort outside of Los Angeles, California, and the Magic Kingdom near Orlando, Florida. While the Magic Kingdom was modelled after its namesake California counterpart, making it somewhat similar, overall it really is a totally different experience. How does one choose? Here are some suggestions. Although Los Angeles is a far sight bigger than Orlando, they both have excellent air service, with a lot of international and domestic flight connections. Los Angeles has more just because it’s a hub to so many airline alliances, but regardless, the flights shouldn’t make too much of a difference – though remember if you’re flying from Europe, tack on an extra 3+ hours to get across the US to California; Heathrow to LAX is an 11 hour flight! Once here, both cities make it relatively easy and painless to get to any of the resort hotels you choose. The Magic Kingdom wins for convenience, though – the “Magical Express” offers any travellers staying at a resort hotel complimentary round-trip airport transportation, including luggage delivery straight from your room within 4 hours. There is a “Disneyland Resort Express” shuttle from LAX airport, but it requires a fee. While Magic Kingdom has a lot more add-on attractions, the parks themselves are roughly the same size, with the castle sitting in the centre and then each of the “lands” or areas (Main Street USA, Tomorrowland, Adventureland, etc.) all radiating out like spokes on a wheel. Some say that the Magic Kingdom is a bit more experiential; the spacing is a little more roomy, and there are those famous “utilidors” that allow park employees to travel in tunnels unseen, so sometimes it appears as truly magical when a costumed character appears out of nowhere. As for the rides themselves, the park’s list of rides are very similar – if not almost the same – but the rides are slightly different at each park. If you’re into doing lots of rides, Disneyland is a good choice because everything is close together, so you can hop from ride to ride quickly. Food and snacks are pretty much on par between the two, but in both cases I’d suggest you also consider dining options around the parks; if you’re at a resort hotel, many of these have some of the best meals, both in terms of value and taste. California: From Disneyland, you can easily drive to San Diego, or further explore Los Angeles. Or heck, take a coastal drive up to San Francisco. I think the key is driving… you could actually just stay on the Magic Kingdom Resort and take shuttles around to the myriad of attractions. In California, Disney is just one small portion of a ton of other things to do. Florida: The kingdom really is a bit kingdom-ish – it is huge! I think the big difference here is if you choose to get out of town, you have a ton of beach options to choose from – great beach cities line the east coast all the way down to the southern tip, Key West. As far as weather goes, Orlando is more humid and hot than Southern California will be, but both have pretty good track records as far as weather goes. (Perhaps this was part of choosing to put theme parks here!) Keep in mind the California coast gets chilly at night, so don’t forget a jumper if you head for the west. Bottom line is that no matter what you choose, Disneyland in California or the Magic Kingdom in Florida, you’ll be guaranteed a great time and lots of laughs. And that’s what is important, right?